NEW WINK HUB FIRMWARE UPDATE! We’re pleased to announce the newest Wink Hub update is now available. This means the Hub to Hub 2 transfer option is now active. If you have a Wink Hub 2 with no devices connected to it, you may now transfer everything over from your original Wink Hub. We know many of you have been waiting for this update for a long time, so we wanted to make sure it was right. Thank you for your patience! *Please note: We recommend placing your Wink Hub at least 15 feet away from your wireless router before you update to reduce interference. Once you are up to date, you can go to the Hub 2 page and initiate the transfer by selecting “Yes, Replace Hub”. We’ve also been working to improve the Z-Wave functionality of the Hub and will continue to make improvements to Z-Wave stability on future updates. If the Wink app shows an update is available for your Hub 2, we suggest you grab it! The update will contain the very same Z-Wave improvements. If you have any issues updating your Wink Hub, give us a call and let our friendly team assist. We're always here to address your questions or concerns, take feature requests, or help with anything along the way. Our real live Wink Support technicians are available at 1-844-WINKAPP, from 11AM to 9PM EST, Monday through Saturday. You can also reach out 24/7 via email (questions@wink.com) or on Twitter (@WinkSupport). If you’re an original Wink Hub owner considering an upgrade to Wink Hub 2, we’ve made it quick and easy to move all of your connected devices, automations, and personal settings from the Wink Hub to Wink Hub 2. Just make sure you have version 5.1 of the Wink app installed, follow these steps (the Wink app will do the heavy lifting), and the transition will be effortless. Step 1: Make sure your original Wink Hub is plugged in and updated with the latest firmware version. Step 2: Plug in your Wink Hub 2 and the Wink app will automatically detect and connect it to your Wink account. Wink Hub 2 will then complete an update so that it’s running latest firmware version. 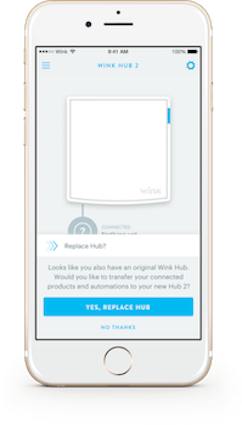 Step 3: Once the update is complete, the Wink app will then ask if you would like to transfer the products from your Wink Hub to Wink Hub 2. You may begin the transfer immediately, or choose to do it later by tapping “No, I’ll use both Hubs.” The transfer menu can later be accessed from the Hub Settings page within the Wink app. Step 4: Enter your Wink account password to initiate the transfer. The transfer typically completes in a matter of minutes and in no more than ten minutes. *In the unlikely event there is an error during the transfer process, the Wink app will prompt you with an error message. Step 5: Once completed, a success message will appear in the app. All of your products and settings, including the Hub name, will be restored under your new Wink Hub 2. Your original Wink Hub will revert to factory settings. The transfer process will migrate all Lutron products, and the automations you've created with them, over to Wink Hub 2. After the transfer is completed, Wink will prompt you to connect each of your Lutron products with one tap in the Wink app, and one quick physical interaction on each product. The reason for this is that Lutron's proprietary radio does not allow for direct product transfer. Step 6: Once the transfer process completes, you will be prompted to reconnect your Lutron products. Tap “Reconnect” and you will see a full list of your Lutron products. You can also do this at a later time (just keep in mind that Lutron products will remain offline until this is completed). 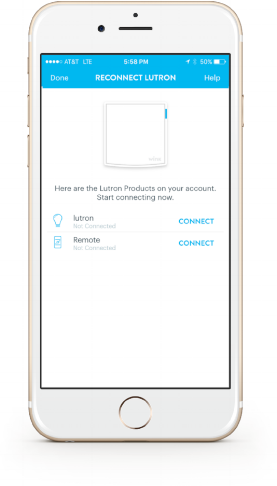 Step 7: Tap “Connect” next to each Lutron product and follow the in-app prompts. If you decide to do this at a later time, you’ll be prompted with a banner the next time Wink detects you have Lutron products that need to be reconnected. Then you’re good to go!